The blurb was a definite hook for me, especially with the Graceling being one of my all-time favorite young adult fantasy novels. But the language and terminology confused this 38-year-old writer/avid reader, so I wonder how much a young adult will comprehend while reading. At the start, the reader is thrust into a harsh world, with Khya as our narrator. She's a strong, stubborn, responsible role model of a character, with utter devotion to her brother – Yorri. Yorri was one of my favorite characters. The strong connection the brother and sister shared was endearing. The universe created was diverse, with three genders and no sexual orientation qualms. I give mad props to the universe the author created, all the time spent researching and maintaining the world-building from start to finish, the ability to write a highly complex novel. I do recommend this title, but only if the reader downloads a sample to get a feel of the writing style and world-building. While I can appreciate the story, I won't be reading the sequel. After a lifelong obsession with books, Erica Cameron spent her college years studying psychology and creative writing, basically getting credit for reading and learning how to make stories of her own. Now, she’s the author of several series for young adults. She’s also a reader, asexuality advocate, dance fan, choreographer, singer, lover of musical theater, movie obsessed, sucker for romance, Florida resident, and quasi-recluse who loves the beach but hates the heat, has equal passion for the art of Salvador Dali and Venetian Carnival masks, has a penchant for unique jewelry and sun/moon décor pieces, and a desire to travel the entire world on a cruise ship. Or a private yacht. You know, whatever works. Her debut novel, Sing Sweet Nightingale, released March 2014 and it was the first volume of The Dream War Saga. In May 2015, Erica and her co-author Lani Woodland launched the Laguna Tides series with Taken by Chance. Riptide’s new YA imprint Triton Books will release both books in the Assassins series, Discord and Nemesis, in 2016. The Ryogan Chronicles, a fantasy trilogy set to launch through Entangled Teen, will launch in 2017 with Island of Exiles. 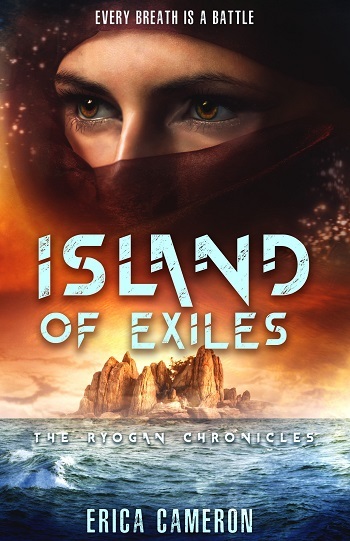 Reviewers on the Wicked Reads Review Team were provided a free copy of Island of Exiles (The Ryogan Chronicles #1) by Erica Cameron to read and review.